GoPro makes the world's most versatile cameras. GoPro helps people capture and share their lives’ most meaningful experiences with others—to celebrate them together. 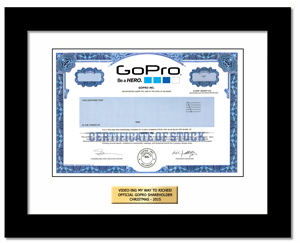 GoPro has chosen to not issue paper stock certificates and registers ownership electronically instead. The recipient still becomes a real shareholder of GoPro with all associated rights.